Uncover the hidden treasures of Jordan on this 10 day luxury tour. Visit the ancient Roman city of Jerash, view the Treasury at Petra and gaze at Wadi Rum. If you have a lingering sense of curiosity and wonder, you’re free to explore them on this delightful 10 day journey uncovering the hidden treasures of the Kingdom of Jordan. 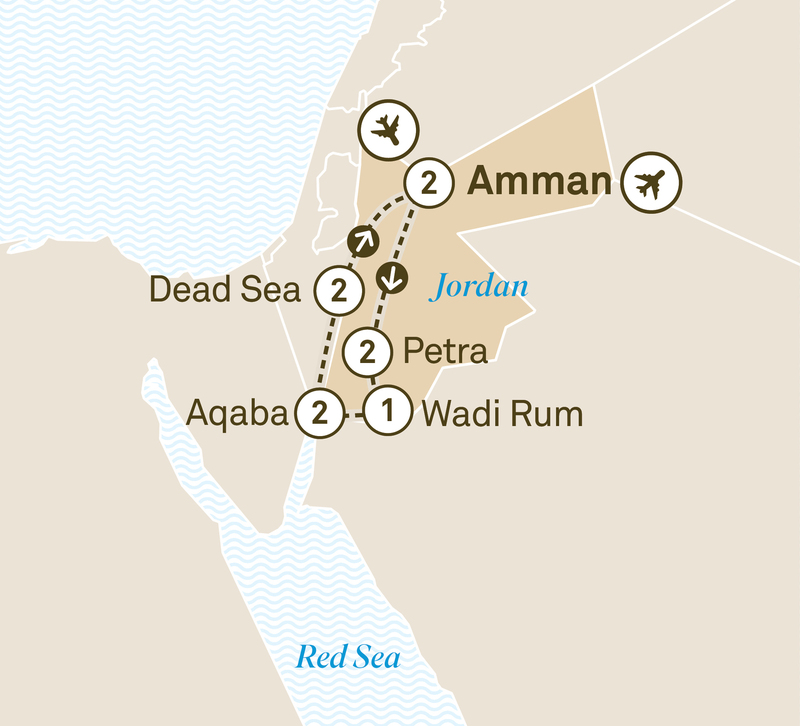 The ebb and flow of empires has touched the intriguing Hashemite Kingdom of Jordan for thousands of years. History buffs will be in their element, with plenty of Roman ruins and biblical sites to explore before experiencing one of the world’s great travel moments – a visit to the World Heritage-listed Site at Petra. Follow Lawrence of Arabia’s escapades into the desert wonder of Wadi Rum, then relax on the shores of the Red Sea and, finally, float in the hypersaline waters of the Dead Sea. Your journey into wonder begins in Amman, the capital of the Kingdom of Jordan, where you’ll enjoy a two night stay. Tonight, join your Tour Director for a dinner of local delicacies. Discover the ancient Roman city of Jerash, inhabited since the Bronze Age. Explore the impressive ruins and witness an exciting re-enactment of a Roman chariot race in the hippodrome. During a visit to the Royal Automobile Museum view the extensive private collection of the Royal Family. At Madaba discover the famous mosaic map of the Holy Land then continue to the rose red city of Petra for your two night stay. This magnificent World Heritage-listed city is the legacy of the Nabataeans, who settled in southern Jordan more than 2,000 years ago. The impressive eastern entrance leads through a brilliantly coloured narrow gorge to the imposing Treasury, more than 40 metres high. Designed to impress, the rock-cut facade will take your breath away. This is only the first of many wonders you will discover here today. After a free morning in Petra, continue your journey to Wadi Rum. You will feel like you have stepped onto the moon during your Special Stay in the luxurious Martian tents of the Sun Camp. Witness the vivid and dramatic colours of the desert at sunset over a refreshing drink. This morning travel in the footsteps of Lawrence of Arabia as you discover the dramatic desert landscapes of Wadi Rum. Explore Lawrence Road and be awed by the vistas of ancient valleys and towering weathered sandstone mountains rising out of the pink and white sands. Later, continue south to Aqaba for a two night Special Stay. Relax in the luxurious surrounds of your hotel, step onto your balcony with sweeping Red Sea views or take a dip in the pool. Cruise and snorkel the Red Sea in search for marine life. Alternatively, you may choose a relaxing Spa treatment. The afternoon is at leisure to relax and enjoy the facilities of your resort. Travel north toward the Dead Sea, stopping at Bethany Beyond the Jordan to see where Jesus was baptised and view the memorial to Moses at Mount Nebo. Continue on to the Dead Sea for a two night stay at your luxurious resort. Relax and take in the views over the Dead Sea across to Israel from your balcony. Enjoy the facilities of your resort including direct access to the sea. Spoil yourself and allow the staff to slather you in the therapeutic mud. Or float in the hypersaline waters of the Dead Sea, while reading a book or the newspaper. Join your Tour Director at the Sky Bar and toast the end of a wonderful journey. Say farewell as you transfer to Amman airport taking a lifetime of wonderful memories with you.